Our puppy classes require that clients bring their dogs in a harness. This is for safety purposes as we do not want any pulling on a dog's neck. No-pull harnesses are best when training a dog to walk on leash and my recommendation is the Freedom No Pull Harness. 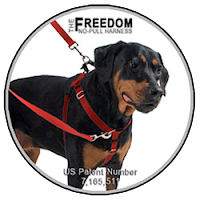 "The Freedom No Pull Harness was designed, invented, and patented by Jessica MacDonald, co-owner of this website and USA Dog Shop. Made in the USA: US Patent Number: 7,165,511. The Freedom No Pull harness is extremely effective for training and minimizes the effect of pulling for several reasons: (1)- tightening effect of the loop on the harness, (2)- the location of the loop, (3)- the reconfigurable design that allows you to attach to only the back or to the front and back of the harness simultaneously. "